"Since ancient times the most refined art of enlightened scholars has been painting." China has a rich tradition in art that goes back thousands of years. Ancient Chinese believed that painting, with its focus of spirit, its delicacy and subtleness of brush strokes, was the one and only true art - they did not consider sculpture art because of the physical labor involved in its making. Those who made sculptures were considered artisans. (craftsmen who earned money for their labor) They believed that artists should not be involved in the business of making money. The ancient Chinese also believed in the benefits of combining the physical with the spiritual. 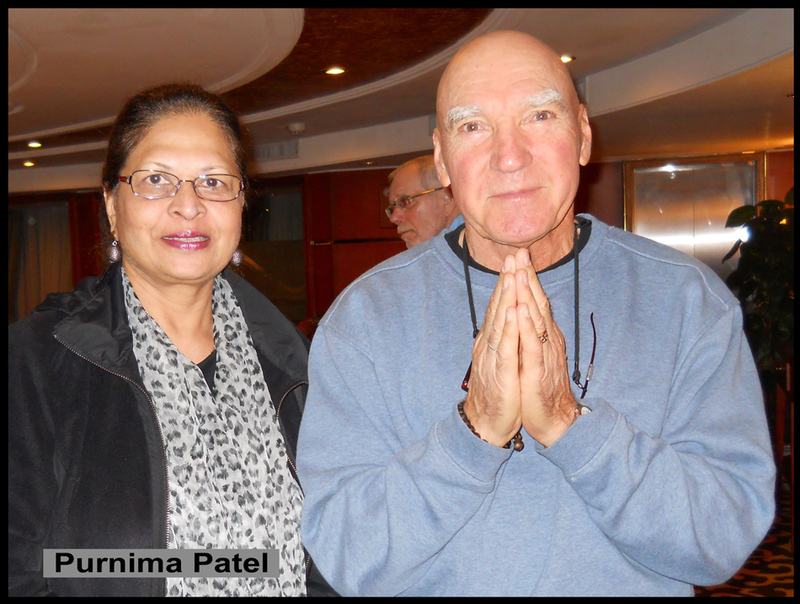 They believed that a physical ordeal combined with spiritual devotion is a means to a higher consciousness. An example would be the Shaolin Monks where martial arts training combined with calligraphy (painting), is part of their spiritual training and is considered and essential component in attaining enlightenment. That shortsighted outlook overlooks the spiritual and emotional dedication and mental energy that is involved in a protracted physical ordeal. When you toughen your resolve, dedicate you spirit, and discipline your body you gain a deeper understanding into the potential for creativity that resides within your soul. It is not a waste of time. I believe for artists it is essential for the maximizing of the artist's creative potential. I have devoted almost fifty years of my life to art (the spiritual) and now have a seven year commitment to weight resistance training (the physical). I am hoping this trip to China will help me merge the two disciplines and perhaps give me some insight into the Tao, "the way," so that I might become a more complete artist. Our tour does not go to the Chan Buddhist temple on Mount Song, where the Shaolin monks are located, but it does include a trip to Xian to visit the Wild Goose Pagoda, a Buddhist Temple that holds the Sutras that were brought to China from India by the Buddhist translator and traveler Xuan Zang. 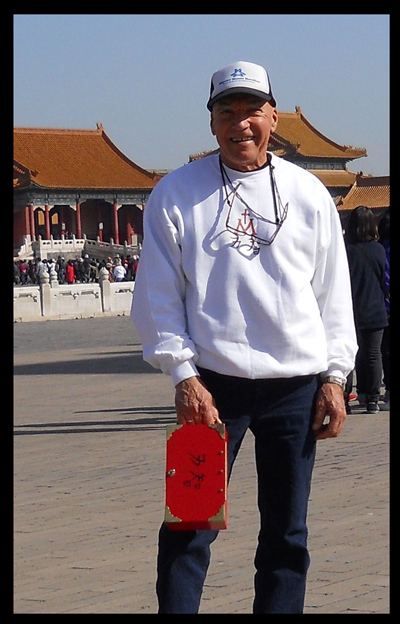 I will be painting while in China particularly on the Great Wall, a goal I set for myself fifteen years ago. I made a special painting box for my brushes, colors, and paper. It's bright red and on it I painted the Chinese characters for "Strength and Wisdom" to constantly remind me of my goal. When we visited the Wild Goose Pagoda I happened upon some monks at a table writing in Chinese script. I went over and gestured that I would like to write something. They handed me some paper and a brush. I surprised them when I showed them I could write Strength & Wisdom in Chinese characters. Seeing this, our tour guide, whom I had talked to earlier and whose father was a Shaolin monk, came over and told them I was an artist from America who was interested in combining physical strength with spiritual wisdom. They all seemed amused and nodded in the affirmative. They invited me to sit with them while they wrote my name and my country along with Strength & Wisdom on a sacred tile. They told me the tile would be placed in the temple. I gave them my Web site card with my muscle photo and my Web site address on it. They found the muscle pose very amusing and called over several more monks to show them the card. They blessed several things for me to bring back to my studio/gym. When we visited the Panda Bear Breeding Research Center in Chongqing I stopped to do a quick Panda painting when I spotted some Zen Buddhist monks who were looking at their i-pads and cell phones. I thought that was pretty unusual so I started doing a little painting of them. Pretty soon some people started gathering around me and that brought the monks over to see what I was doing. 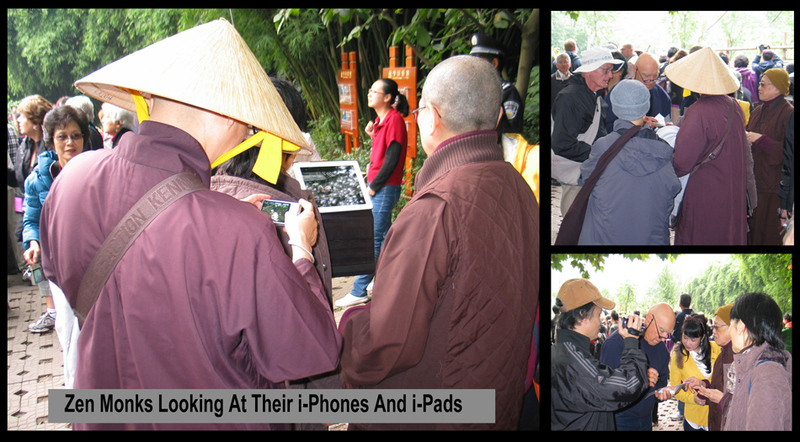 They found my painting pretty amusing as they laughed and pointed at the i-pad I had painted in one monk's hand. I signed the painting and gave it to the head monk. Then, because I assumed they were on the Internet, I gave them some of my web site cards..they laughed and made muscle poses. Someone who was with their party videotaped the whole thing...It was a fun day. Oh yes, the Pandas were very cute. 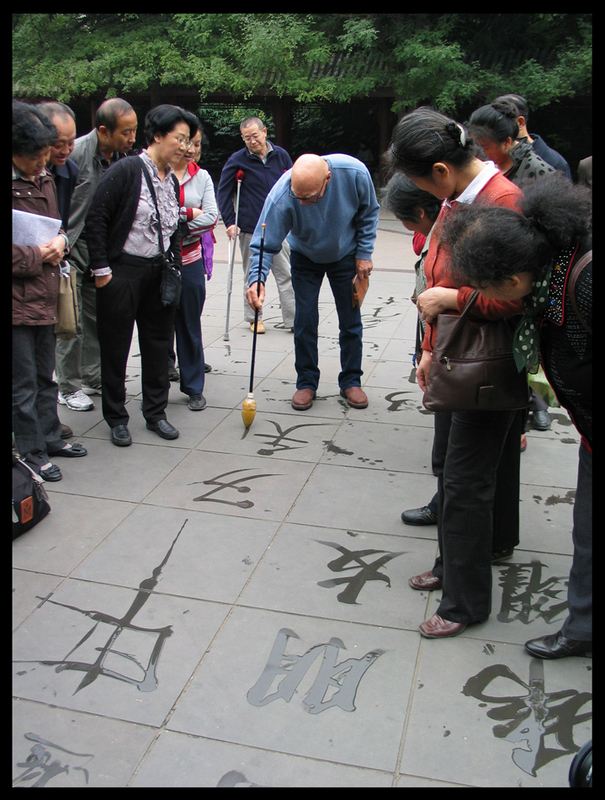 At various plazas and parks we would see poets writing poetry with Chinese characters on the cement tiles using a large brush with water. The characters are only visible for a minute or so before they evaporate. At this park I followed a poet as he wrote his characters along the tile, then I gestured toward his brush and he handed it to me. I wrote, "Chinese are strong and wise." I knew what the characters were and the right number of strokes but my proportions were off so my characters were rather clumsy looking. When doing Chinese characters there are three things to remember. The number of strokes, the proper sequence of the strokes, and the right proportion. To have the proper proportions takes years of practice. However I heard a mummer of approval from the Chinese people who were watching me when I did the proper sequence. They knew I had studied the art of writing Chinese characters and wasn't just being silly or trying to mock them. 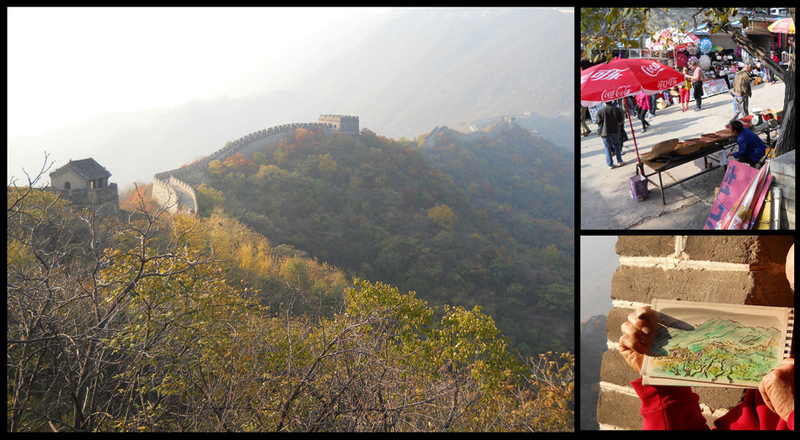 After fifteen years of waiting I finally got to do a painting on The Great Wall of China! But before I could start painting I had to run the gauntlet of tee shirt and trinket stalls that line the pathway up to the tram that takes you to the top of the wall. That isn't easy because those sales people are pretty aggressive. Once I got up there I headed for the highest point which was a watchtower. Out a small window I saw the view I wanted to paint..(that's me in the right hand corner with the red sweatshirt on) I didn't have a lot of time to paint because in the morning we spent a lot of time touring a Jade factory. But I remembered an old Chinese proverb that goes, "Prepare slowly like the buffalo - paint swiftly like the swallow," so I was able to knock off a couple of paintings in less than an hour. 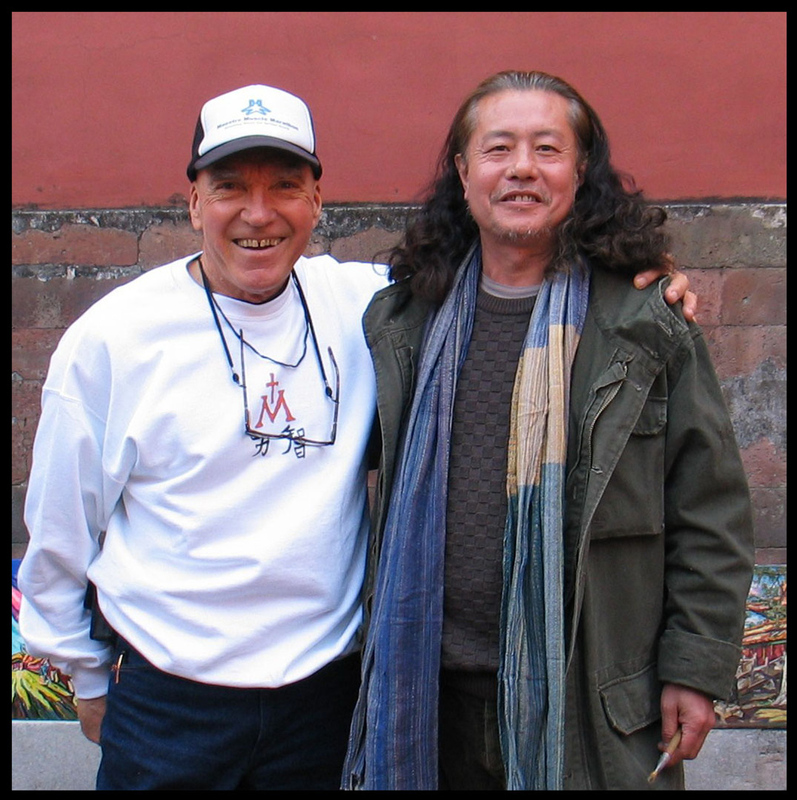 I met a Chinese painter named Guo Hong Yi in the Forbidden City. 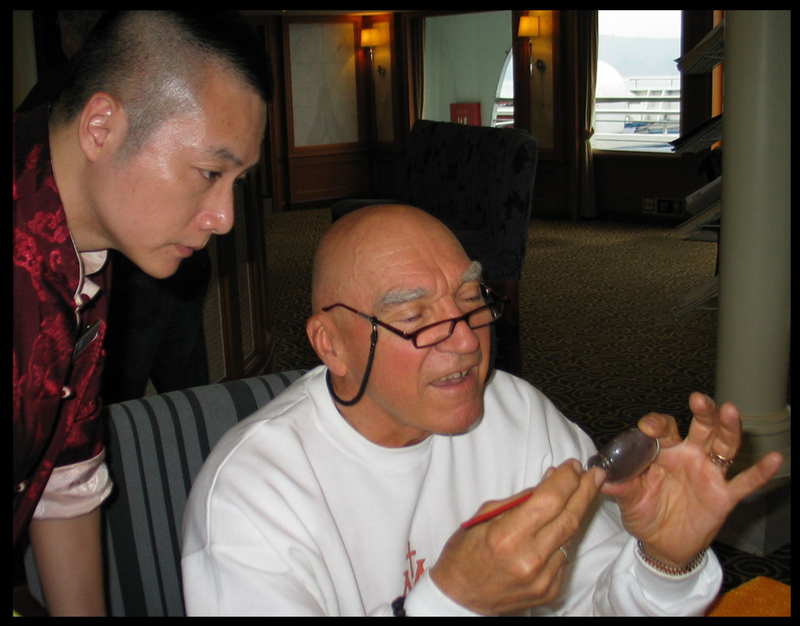 He is a professional painter and a member of the China Artists Association. He was a pleasant fellow but he didn't speak English so we just gestured a lot. In China there are artists who paint small delicate paintings inside various designed glass objects like tea pots and bottles. It is very delicate work and very hard to do. You have to get into the bottle through a very small opening with an angled brush and be very steady. First you do the drawing in black then you add detailed color then broad color to finish it off. If you mess up you can't erase it you just have to throw the bottle away. This artist let me have a go at it.....and yes, later he had to throw the bottle away! In Shanghai we went to the Bund, a riverside promenade where there are some very European style buildings built by the English in the 1930's. On the promenade there was a group of school children, about 9 years old doing drawings of an ornate building across the street that looked something like a state capital building. I couldn't get over how technically advanced these kids were. All their drawings were realistic and very detailed; it was almost like they were mimeographed copies. The only difference between drawings was that some were using different color ink on different color paper. I looked closely to be sure they were doing them freehand and to my amazement they were! I thought how in the world did they teach these young children to do that. I decided to step back and do a quick little drawing myself. When one of the little girls saw me she came over to see what I was doing. I showed her my drawing and she gave me a "thumbs up!" It was such a sweet thing for her to do. It made me feel so good I signed the drawing and gave it to her. Her teacher asked her to hold it up while he took a photo of us together. Later back in the classroom he probably told her, "Now that's NOT the way to draw." But with any luck I may have opened her mind up to another more spontaneous way to draw, and perhaps she will see that art has no boundaries and that artists have no shackles and are not bound by any one style or dogma. During our Yangtze River cruise we docked at Fengdu for those who wanted to take a "peapod" boat trip up the "lesser three gorges." Because the weather was bad Alice and I opted out in order to rest and enjoy a leisurely day on the cruise ship. I went up to the lounge area and did a few paintings. Because most of the group was gone for the day the staff of young Chinese didn't have much to do so some of them came over and practiced their English while they watched me paint. 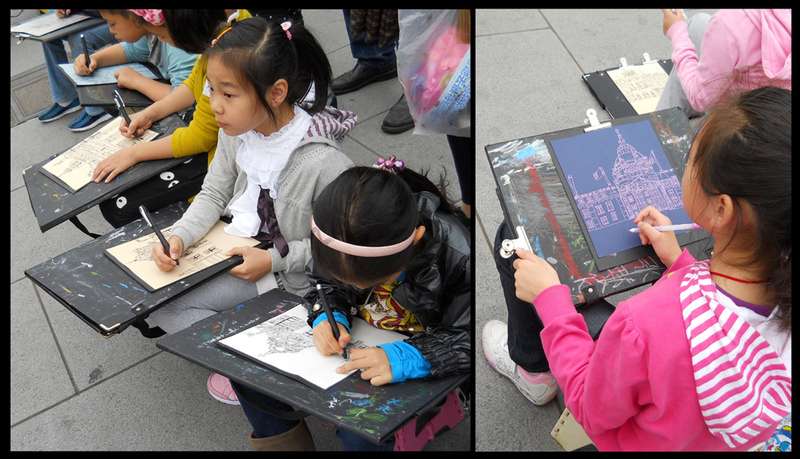 Before I left the area I gave these two young girls each a painting. In General the Chinese people look lean and fit and in good health - except for the fact that some still smoke. The government actually passed a law whereby people must exercise. The Physical Health Law of the People's Republic of China was adopted in 1995. In the same year, the State Council promulgated the Outline of Nationwide Physical Fitness Program, followed by a series of rules and regulations. The Nationwide Physical Fitness Program encourages everyone to engage in at least one sporting activity every day, learn at least two ways of keeping fit and have a health examination every year. In squares and parks it is not unusual to see groups of people dancing, doing Thi Chi or some other physical exercise. They didn't object when I joined in. Looking down out our hotel room window I could see groups of people exercising every morning without fail. I'm starting to see some exercise groups in America too these days. It's all good. I would say this trip to China was a great success. I came away with almost twenty small paintings, and most importantly I made spiritual contact with several Buddhists monks. I also was able to experience this wonderful country, its food and its people, up close and personal. On top of that I handed out several paintings and passed out quite a few of my Web site address cards to the young Chinese I met. With America having only five percent of the world's population, as an artist it would be nice to somehow engage the other ninety-five percent of the people in the world through my web site. I know this trip to China has been a life changing experience for me and I will never see myself or the world I live in the same again. Over the months and years to come I will have much to ponder.